These recipes originally appeared in INSIDER magazine in The Irish Independent on Thursday the 8th of May. After feeling responsible for cursing the weather on our first of May column, this week our Insider recipes were specifically designed to be adaptable to our unpredictable spring/summer (sprummer?) weather. 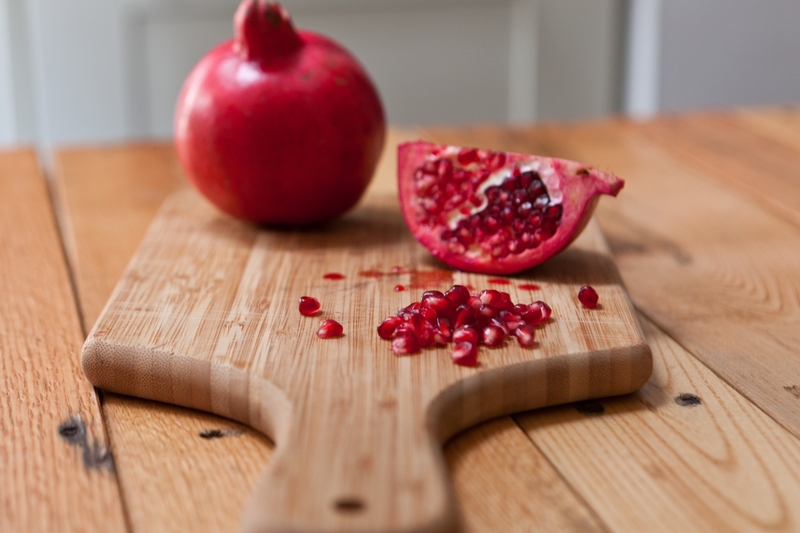 Our granola uses the jewels of pomegranate which help make dishes beautiful all year round and our lamb dish brings summer flavours to the comfort of a roast dinner. There’s a certain feeling of satisfaction (or is it smugness? We’re never sure of the difference) that comes with making a big batch of granola on the weekend to be enjoyed throughout the following week. We top ours with the seeds of a pomegranate and a good dollop of natural yogurt, usually Glenisk (http://www.glenisk.com/) or Glenillen (http://www.glenilenfarm.com/). Pre-heat your oven to 160c/140c fan/Gas mark 3. Mix the sunflower oil, golden syrup, honey and vanilla extract together in a large bowl. In a second bowl, mix the cinnamon into the porridge oats. Now add the oats into the large bowl, mixing them into the syrup until really evenly coated. Spread evenly onto a baking tray (you may need to use two baking trays if you don’t have one that’s big enough to hold all those oats in a shallow layer) and roast in the oven for 15 minutes. Remove from the oven and add the almonds to the oats, mixing everything around but being careful not to break up too many oaty clusters – that’s what makes a crunchy granola. Return to the oven for another 10 to 15 minutes or until the oats are golden brown. Remove from the oven and allow to cool completely before mixing the dessicated coconut through the oats. Spoon a serving into a breakfast bowl and top with a dollop of yogurt. Remove the seeds from the ½ pomegranate and serve your granola by sprinkling the seeds over the top of the yogurt. Transfer the remaining granola to an airtight container where the granola will keep for up to a month. Ours rarely lasts that long though. We love lamb. We love a luxuriously roasted leg of lamb but are also fans of the convenience of lamb loin chops. We’re lucky in Ireland to have access to some of the best lamb in the world. Connemara Hill Lamb (http://www.connemarahilllamb.ie/) is so good that it has protected geographical indication by the EU. We really like Coolanowle Organic Butchers (http://www.organicmeat.ie/) and James Whelan Butchers (http://www.jameswhelanbutchers.com/) who make sourcing great Irish meat just a mouse click away. 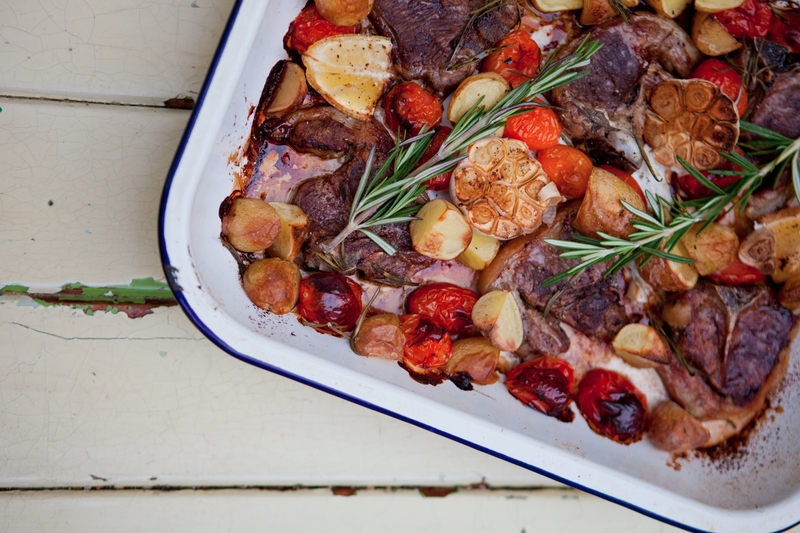 For us, lamb works best with the Mediterranean flavours of bursting tomatoes, roast lemon and sticky balsamic vinegar. Pre-heat your oven to 200c/180c fan/Gas Mark 6. Place your lamb chops in in a large roasting dish. Cut the new potatoes into quarters and scatter them around the chops. Add the cherry tomatoes to the roasting dish as well. Chop the bulb of garlic in half and rest both halves in between the lamb, potatoes and tomatoes. Slice your lemon in quarters and pull the leaves from 2 sprigs of rosemary and add to the roasting dish, scattering around the other ingredients. Drizzle the balsamic vinegar and olive oil evenly over the ingredients before sprinkling generously with salt and pepper. Add the other 2 sprigs of rosemary to the dish before putting the whole lot in the oven. Roast in the oven for 20 to 25 minutes until the lamb is cooked through and the spuds are lovely and soft. Meanwhile, pick the leaves from your fresh mint and add to a food processor. Grate in the clove of garlic and add a squeze of lemon juice before blitzing until the mint is finely chopped, gradually adding enough olive oil to cover the mint and create an easy to drizzle consistency for the pesto. Serve the lamb with the roast new potatoes, tomatoes, slice of lemon and a good drizzle of mint pesto.